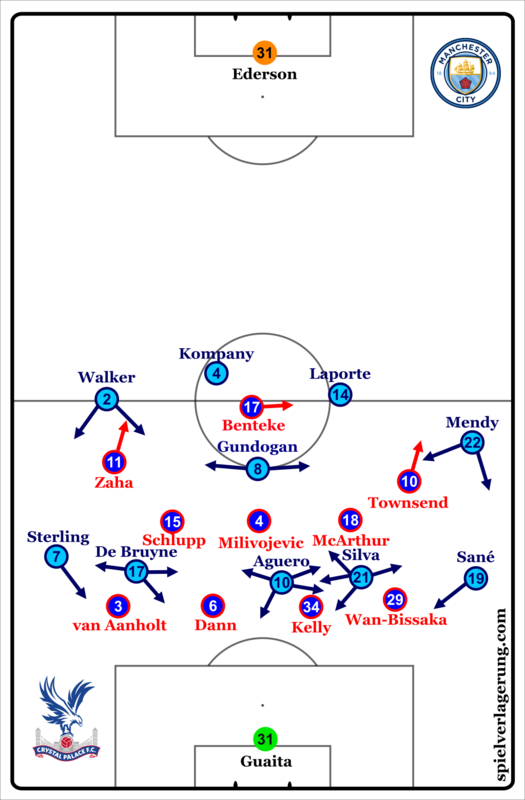 The basic strategy was to attack down the left side, to build through Laporte more, who is generally better in that than Kompany -who probably got to start to offer physicality in covering Benteke, essential strategic point in selecting the line-up-, plus in this way most of the ball losses happened at Palace’s right-side, in that way to prevent them playing more on their better left side, towards Zaha -who was always doubled on the right by Walker & Sterling in defending. On the left side, starting in the usual 4-3-3 -turning into a 2-3-2-3 in possession, or 2-3-5 in front of the oppositional box-, several movements has been made to cause issues for the oppositional 2nd line, to create imbalances. Direct switch between Walker and Mendy in the halfspaces. As Walker dribbles inwards it pulls Milivojevic out of position, creating a gap between him and McArthur, whose basic orientation was to close towards Silva, which opens the diagonal lane towards Aguero. The pass to him attracts both CBs, therefore Silva immediately makes a run behind to exploit the vacated space between the RCB-RB. Gundogan tended to make outward movements, to have on-ball actions in either halfspaces, in that way he could not only separate himself from from the 1st line/Benteke -who in most cases stayed up high, not offering much in defending, waiting for passes to receive at counter attacks- allowing himself to be open and receive, but could also manipulate the oppositional central-midfielders to step out from the 2nd line, as he drove forward in these channels. The spaces behind the 2nd line were occupied by De Bruyne on the right, Silva & Aguero on the left, whilst both wingers stayed out wide to offer width high up on the pitch, plus to stretch the last line and create channels in between for the players in between the lines to make runs into -this also reduces the cover from the last line to the spaces in between the lines. Gundogan varied his positioning to move outwards to the left or right, the latter happened in order to open up spaces for Laporte to drive forward into. Here in between the lines Silva and Aguero often switched positions -as in horizontal switches-, which caused covering issues for Palace in several cases. As Silva moved up higher, the 2nd line couldn’t effectively offer cover towards him, since he was not in their visual field, plus the basic intention from Palace 2nd line to be more oriented to offer cover for each other & cover passing lanes, and not being oriented towards the opponents. Therefore this switch caused them issues as they always had to reorient themselves, which opened up bigger gaps in between the lines for Silva & Aguero to receive vertical passes and face the oppositional goal after the turn. 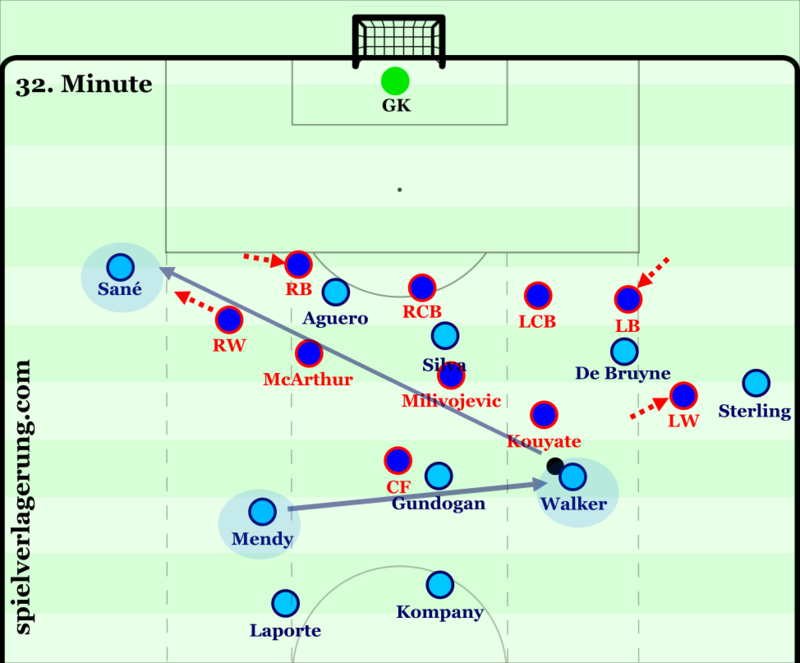 In most cases Aguero occupied the left halfspace closer to the 2nd line -manipulating McArthur’s orientation outward-, whilst Silva occupied the central areas, the channel between McArthur and Milivojevic/RCM-DM -this movement was mostly defined by Silva’s positioning, Aguero to make complementary movements. As Laporte & Gundogan drove forward in these areas diagonally outwards, this pulled the 2nd line towards the halfspace just enough to open up the central passing lane to Silva. Their movement dynamics also had the pinning effect on the 2nd line, creating even more space in front of them to drive forward into or to receive passes and control the circulation. For example Gundogan received backpasses in front of the 2nd line, a movement trigger emerged: the moment of his 1st touch on the ball was the trigger for Sterling & Sané to make runs in behind, using the concept of diagonality to create orientation issues for the full-backs. As the backpass occurs, the full-backs generally position themselves a bit outwards towards the wingers, and this turn creates a body posture from where their inner side -in front or behind- becomes exploitable with a well-timed run. Again, direct switch between Mendy and Walker, and since the full-backs positioned themselves narrower towards De Bruyne and Aguero & Silva, it opened up spaces for Sané and Sterling to receive diagonal balls at the flanks. Also, since the wingers are positioned wider, space opened up for Walker & Mendy in front of the 2nd line to dribble inwards or to find the diagonal options. 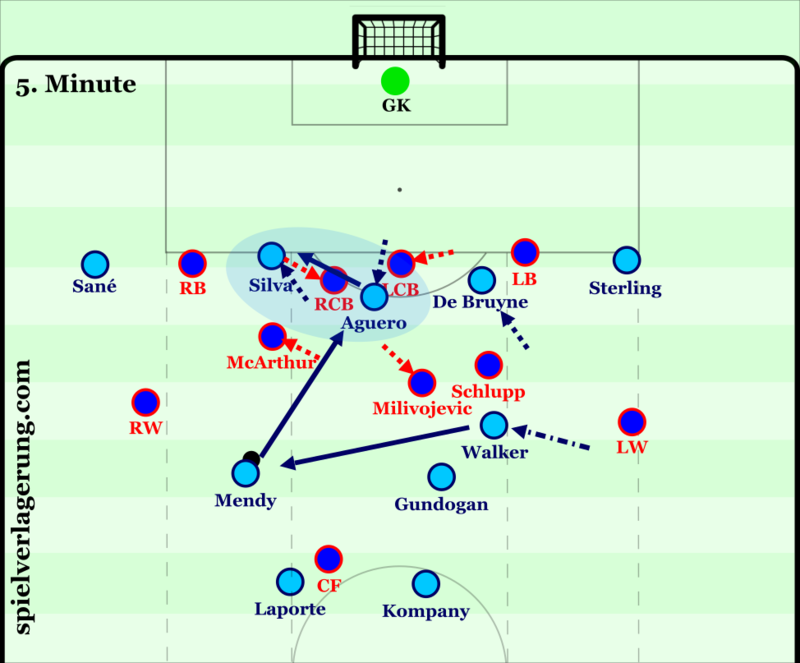 Dynamics after Laporte driving forward: as his direction is basically towards the centre, it creates an orientation issue for McArthur and Milivojevic. McArthur covers towards the halfspace with a diagonal posture, but in consequence of the closer distance between Silva and Aguero, they could flexibly switch channels, resulting an open passing lane towards Silva at the inner side of McArthur. On the other side De Bruyne frequently positioned himself higher in between the lines, being closer to the last line, which divided the left-back’s/van Aanholt’s orientation in defending – due to the 2nd line’s defensive orientation the last line became more manipulable by runs or movements – to create space for Sterling. 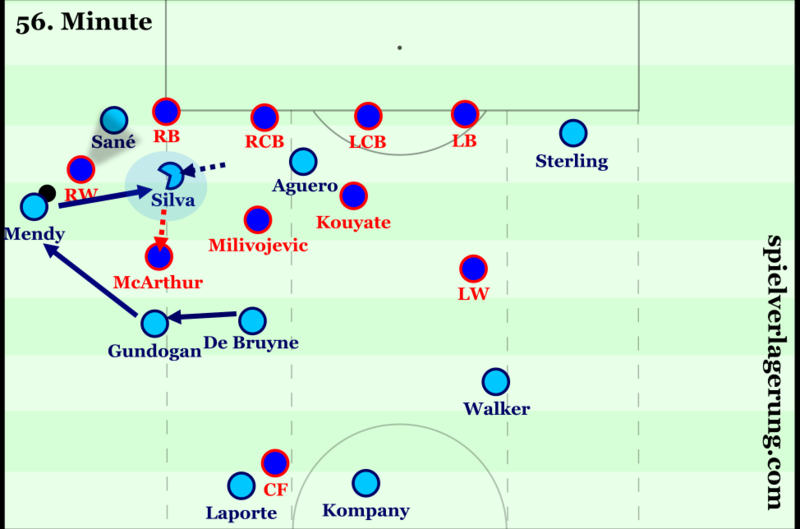 As a result of the 2nd line’s defensive orientation, the last line for Palace had to position themselves narrower to cover the halfspaces more -Silva and De Bruyne-, which ultimately opened up spaces for Sané & Sterling at the flanks, exploited by a huge amount of diagonal balls towards them to change the point of attacks constantly – sometimes the wingers were the ones who dropped deeper to close these diagonal balls, therefore the FBs could stay in position, preventing the stretching effect. Although at the same time this gradually forced the wingers to position themselves deeper, therefore they had even less forward presence in case the won the ball and tried to initiate a counterattack. Walker meanwhile was mostly used to participate in the circulation phase, without offering significant offensive presence, as his role was to help moving the oppositional structure from one side to the other -using Sterling to gain both vertical and horizontal space, then circulating back and trying to penetrate on the left. After circulating from the right to the left side, Palace’s 2nd line had issues with shifting adequately in the optimal tempo, as Milivojevic tended to be wider, which opened up central passing lanes between him and McArthur. City tried to directly create this issue, with Gundogan moving over to the right to pull Milivojevic out of position, opening up the gaps for the vertical passes. If Sterling had more space to receive, Kompany often skipped the pass to Walker, switching directly to Sterling, to fasten up the circulation. Movement trigger – backwards pass to Gundogan: after Mendy dribbling inwards Gundogan receives the pass and turns towards the right with, which creates an issue for the LB -not only in his body-posture but also positioning-wise-, who basically has to cover both De Bruyne and Sterling. As Gundogan makes the 1st touch on the ball, Sterling immediately makes a run behind the LB. On the left, the usage of Mendy raises several interesting question and aspects to consider. Due to his weaker ability on-the-ball -than Zinchenko or Delph-, Guardiola usually changes the dynamics on the left side, to utilise his ability with making runs in behind or to make crosses from advanced positions. Therefore the left-winger tends to leave the sidelines, to pull the oppositional full-back with himself, creating space for Mendy to move higher up and receive in behind the oppositional 2nd line – since the movement often happens in the oppositional winger’s blind-side, allowing Mendy to create a separation, e.g. : shifting error. This movement was also present in this game, as Mendy often moved up higher, whilst Sané moved inside. Dynamics after Laporte driving forward pt.2. 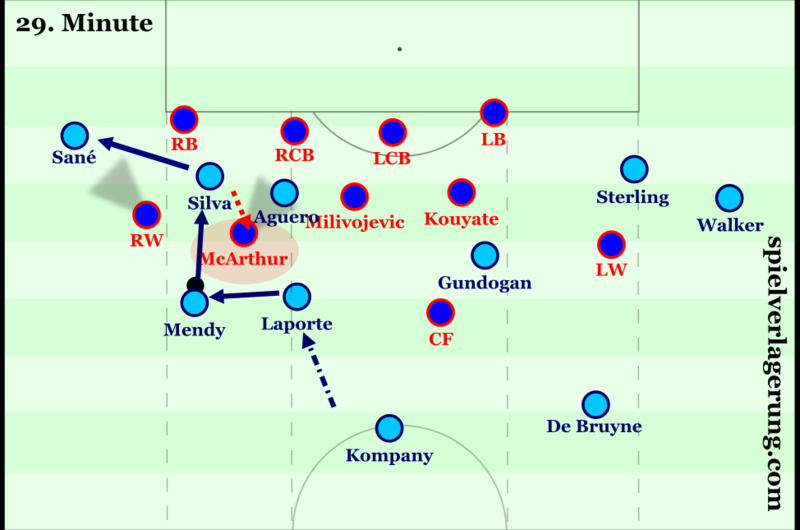 : as he drives forward diagonally outwards it pulls out McArthur, and since the RW is wider and tries to close the outward pass, Laporte and Mendy can basically double McArthur on the left, to open up the passing lane to Silva in between the lines -also important Aguero’s deeper positioning, to strengthen McArthur’s orientation issue, and to offer an option one channel inwards between McArthur and Milivojevic. Although, this often congested the spaces on the left, preventing to create optimal dynamics for Silva and Aguero to receive in the aforementioned pockets, therefore Mendy much rather positioned himself deeper wide, or more central. This generally created a much better dynamics on the left and changed the defensive cover, with the RW to drop towards Sane, RCM to step out higher, so the space behind him could have been exploited – also, better directions to manipulate from Laporte as he drove forward. With now Gundogan moving outwards, same dynamics occurs with pulling McArthur out of the 2nd line, so Silva can exploit the space in behind & in between the lines. 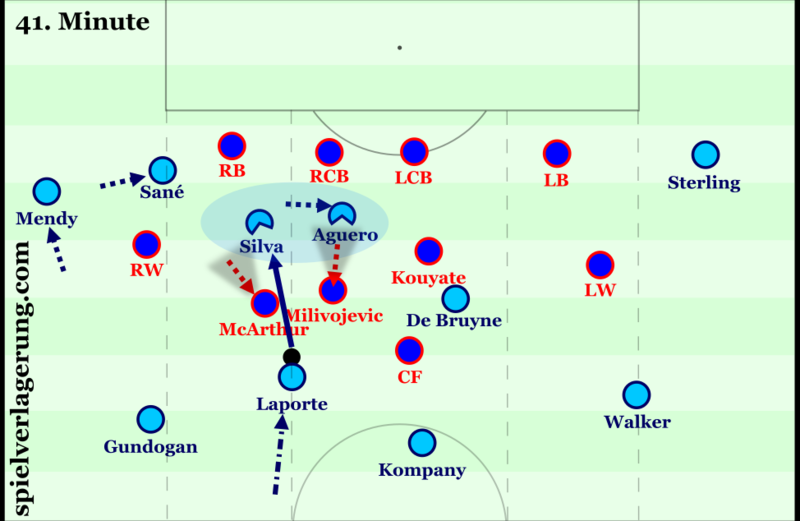 The left-sided overload and emphasis also had a positive effect at the transition phases, as City could better control the ball losses in these zones, with Aguero-Silva controlling the possible passes back into the centre -forcing & guiding Palace outwards-, Mendy-Sané to control the flanks -in most cases the initial position of the ball loss-, and Laporte & Gundogan to offer support and control in depth, with Laporte marking tightly Benteke -Kompany to act as a free-man in behind-, and Gundogan to control the channel for through passes. The effective phases after a ball loss allowed them to have even more control on the oppositional half. Despite basically having effective movements to penetrate in possession, both the first and the second goal came from a fast break, exploiting Palace’s issues to reorganize the structure after ball losses. 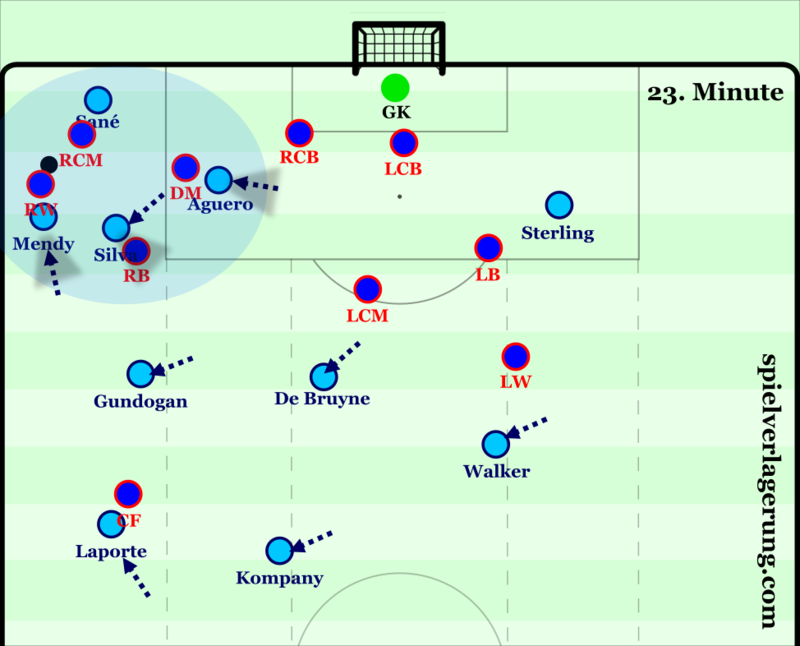 Counterpressing after a lost ball on the left: Mendy immediately pushing up higher to control the RW, Silva & Aguero moving outwards, Silva to close the diagonal pass towards the centre, Aguero to close the sideward pass, whilst Gundogan-De Bruyne-Walker creating a 3-men line behind -functions as the 1st covering line at the back. During a lot of games, City is allowed to operate in increased amount of spaces, mostly due to the results -City leading-, which forces the opponents to press them higher up the field. This fundamentally allows them to play through the oppositional press -one of their principle states in possession, to “invite the press”- as they pull them out whilst circulating the ball, creating gaps in behind the oppositional structure to receive and turn into the open spaces. Thereby creating more quality situations for the attackers in more advanced areas with reduced defensive cover. Although since a lot of these chances are not being exploited, this also generates more transition phases, because the more actions occur in front of the oppositional box in a higher tempo, the bigger the probability of gradually losing the covering shape -rest-defense- in behind, which opens up spaces to exploit for the opponent. As the faster transition, or unstructured phases become more frequent, the tempo cannot be controlled as how City want it -the travel with the ball as a unit, maintaining optimal distances in between during the whole process, “15 pass rule”-, eventually keeping them off-balance. 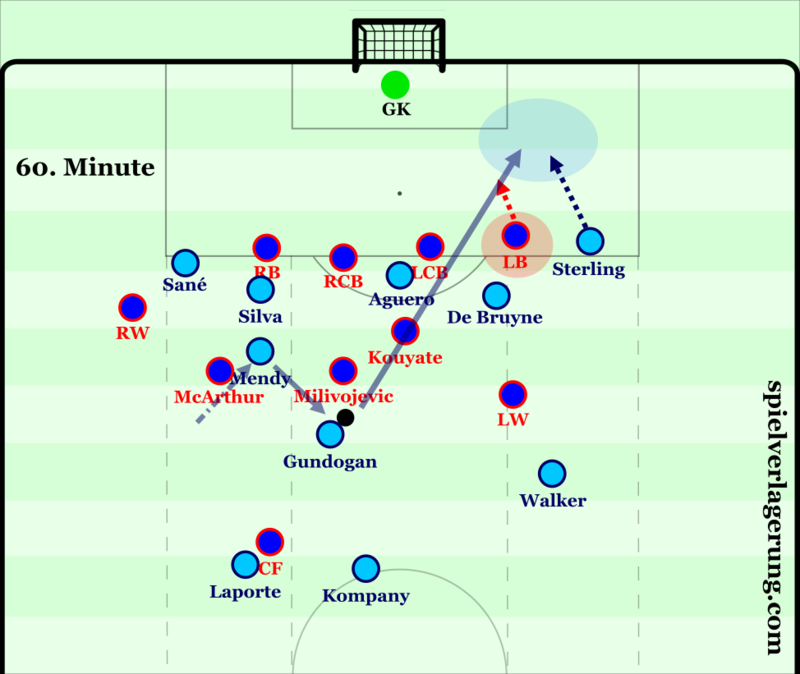 This is what happened after 0-2 -even with moving De Bruyne slightly deeper in possession, to offer more stability-, with City basically enjoying the increased space in behind due to Palace’s change of approach, but also decreased their control on the game’s tempo and space as well -as they often initiated attacks too early. Without finishing their chances City couldn’t shut down the game, and struggled until Milivojevic made it 1-2, which again changed the dynamics as City effectively killed the last minutes with dominating the ball again and slowing down the tempo. The basically easy win maintained City’s advantage over Liverpool in the title race, but the following 9 days will be decisive, as they play 2 times at home against Tottenham -once in the CL 2nd leg and once in the PL-, and they will also travel to the Old Trafford for the Manchester derby.